THIS IS THE SHORT, FAST, WHAT YOU NEED AND HOW IT HAPPENS GUIDE TO GET YOU GOING IN THE RIGHT DIRECTION. It's possible to use your own oven, some varieties of coffee roasters beyond the Behmor, a pan on top of your stove, a modified pop corn popper -- similar to coffee roasting it depends on how much experimentation vs equipment you want. Tip: The Alchemist uses his home built one or a Behmor currently. I like the Champion Juicer to crack beans. It's fast and efficient. And gives you double duty since it can also make roasted nibs into liquor. Peeling by hand is low tech and the way it was done long ago (and in some origins), takes a while, and may be more or less efficient for winnowing at the same time depending on your technique. It's less efficient on time. The lowest tech method (after hand peeling) is a hair dryer set to cold, or a small shop vac set to blow; over a large bowl of nibs and husks. The bowl is circulated with a tossing motion of the hand bringing nibs and husks up slightly into the air, giving the husks a chance to blow away. After that, there is the hand fed Sylph or the automated Aether. Champion Juicer: there doesn't seem to be a good substitute for this one yet. With a small amount of nibs you can skip the grinding stage and go straight to the Melanger, but the bigger your batch the harder that is. You lose a set amount every time you put cocoa beans through the Champion -- six ounces (6 oz) no matter what weight you are processing. You need a Melanger. Either the Spectra 11 for home use or one of the larger ones if you need more. There's not a home substitute for this one either. This is the heavy granite slab with granite wheels that crunches the lumpy cocoa liquor (along with your other dry ingredients and extra cocoa butter, depending on what you're making) into something you'll want to hand to your friends and grandma. To make it a little easier. The Alchemist uses and sells an Escali scale. In order to measure your ingredients, rather than putting them into a measuring cup, they need to be weighed. Wet (cocoa liquor and melted cocoa butter) and dry (sugar, powered milk if you're making milk chocolate) all get weighed. This is a mass not volume business. Cocoa butter and cocoa liquor unfortunately don't come with neat little lines on their wrappers to tell you how much makes a quarter cup. They don't come with wrappers! Molds are optional. If you have them you can make your chocolate into pretty little hearts or squares or fishes. Without them you can pour it into a zip lock bag for storage, onto wax paper in a big puddle which will dry in an uneven sheet that you can break up. An ice cube tray would work for cubes of chocolate. It all depends on what you want to do once you make it. makes your chocolate sweet. Must be dry sugar, not honey, syrup, etc. You need dry milk if you want to make milk chocolate. You can't use ANY liquid ingredients. optional, makes a softer chocolate for eating. You don't have to have it if you're making baker's chocolate. made from soy generally. Most people think of it as an emulsifier, this is not true for chocolate making. In this case it modifies viscosity, it makes a thinner chocolate. It is often used in place of cocoa butter since it is cheaper, but also isn't a direct replacement. then cool them until they are back to room temperature. It's easiest to do this at least half a day before anything else. A full day would be even better. Roasting cocoa beans often smell like baking brownies. Expect to attract spectators if there are any around. Either with the Champion without its screen in, or by hand. You feed the beans in the top and the nibs and husk come out the bottom. Then you do the blowing air and tossing nibs part until there is little or no husk left in the beans if you are using a blow drier.. You'll also have about a six foot circle of husk around you. Winnowing is best done outdoors, or in an area that's open and easy to sweep up. The kitchen is not such a good option. A neater alternative is to use the Sylph winnower. Make sure your liquor is still nicely liquid, and put it in your Melanger to turn it from the sort of lumpy, gritty stuff to smooth chocolate. Start it running as soon as the cocoa liquor is in, and then add the other ingredients a bit at a time. That way the rollers don't have to try to bump over a pile of sugar or dry milk. NO WATER BASED LIQUIDS! If you want to put in brown sugar, dry it for a while in your oven. If you're using them, add the cocoa butter, lecithin, sugar, milk powder, etc. Put the lid on and let it go. We don't leave ours running if we aren't home generally. The thing runs from 18 to 48 hours depending on the chocolate and other ingredients. You can stop it and check how smooth your chocolate is by dipping a spoon in (like tasting batters). If you stop it for a long time it will cool off. You can put the metal and granite part of the Melanger into a slightly warm oven to warm it back up -- this is slow. The plastic knob won't take much heat -- but 100-150 degrees F for an hour or two will remelt the chocolate until the Melanger can run again. If you want shiny chocolate you have to temper it, which takes warming and cooling and making it's structure change. As for all of this, see the Alchemist's real instructions for how to do it. the chocolate's smooth and no longer feels grainy. Pour it into molds, or whatever final holding device you're using. Clean up for as long as it takes go get all the chocolate off the Melanger and you're done. The molds need to cool for a few hours before the chocolate comes out of them. As I said at the beginning. This is quick and dirty. It's not meant to teach you how to make chocolate but to give you an overview. Cocoa beans have numerous similarities to coffee beans, with some important differences in processes. They are both fermented (fermented cocoa almost looks already roasted), roasted and ground for use. Cocoa beans come in three primary species, Criollo, Forastero and Trinitario, but there are hundreds of sub-varieties for each. Very loosely, Criollo is analogous to Arabica coffee in that it is the cream of the crop and has the most delicate and complex array of flavors. But in many cases, this can also mean a very mild chocolate. The Forastero can be compared to Robusta coffee in its disease resistance and higher production, but that is where the comparison ends. Where robusta is just horrid 99% of the time, Forastero is not like that. It has a strong full cocoa flavor, but depending on the grade and preparation, can be rather one dimensional. Well prepared Forastero is what most of us are used to eating in chocolate. Finally, Trinitario is a hybrid of the two, and can have various characters of both parents. Often a Trinitario bean is spoken of as having a strong or weak Criollo influence. Unless specifically labeled, the cocoa beans or nibs you have purchased in their raw form. They are best kept in a cool, dry, sealed location. Like this, they should remain "fresh" 6 months to a year. I don't recommend refrigeration or freezing as it is easy to trap moisture which is not good for cocoa beans. I recommend leaving them in their raw form until you are ready to use them. Roasted beans go stale quicker than raw beans, usually with a shelf life of around a month. I know there is a lot of information out there about the health benefits of chocolate, and I know some people like to eat cocoa in it's raw form for "maximum" health benefits. Personally, I do not recommend eating ANY cocoa raw. All commercial cocoa beans have been fermented by various yeasts and micro organisms, and are often open air dried. In addition, e.coli and Salmonella can be present on the surface of the husk. Proper roasting completely kills any potential surface contamination that may be present, makes them safe to eat and develops the flavors associated with chocolate. And proper, delicate roasting does not significantly reduce the health benefits of cocoa - after all, the benefits were originally found in finished chocolate, not raw cocoa beans. Keep that in mind. There is even some debate as to whether the nutrients and various flavonoids are even nutritionally "available" in the raw form since roasting alters the physical structure of the cocoa bean and makes it easier to grind. If you do want to eat cocoa beans whole as a snack, go right ahead - just roast them first. And if you really don't want to roast them, please peel them. Most cocoa beans that you will encounter for chocolate making are fermented, but are not roasted yet. The fermentation process does darken them up considerably and you may think they are already roasted, but the lack of an evenness in color and texture is the key to telling when they are unroasted. Roasting accomplishing a number of things. It helps separate the outer husk from the inner bean and makes cracking and winnowing much easier. It also virtually sterilizes the cocoa bean. This is rather important as the conditions in which cocoa beans are fermented are naturally full of bacteria, fungi and molds. There is a "quantifiable" risk of infection from unroasted cocoa beans. Roasting reduces this risk. Finally, for those of you who have read about the nutritional value of chocolate and cocoa beans, and worry that roasting destroys these nutrients, please remember that all of the research (to the best of my knowledge) has been done on fully roasted, fermented cocoa beans and chocolate. Sure, if you over roast or over process it, you may well loose some nutrients, but I personally take the nutritional benefits of chocolate as a benefit, not a goal. The flavor is my goal at Chocolate Alchemy. There is a ton of information out there on the web about roasting coffee at home. If you can roast coffee at home (I do), you can roast cocoa beans at home. Sweet Maria's is a great source for coffee roasting information and some supplies. Hot air gun, believe it or not. With all of the methods, the basic technique is the same. Subject the cocoa beans to a high temperature initially, slowly reduce the temperature and stop the roast when the beans are "cracking", but well before they start to burn. The initial high heat lets the beans gain some thermal momentum and allows for a good separation of the husk and nibs as the beans expand. You lower the ambient temperature so as not to burn the outside of the bean, but let the interior continue to roast. Finally, the cocoa beans will start to pop and crack as water vapor is explosively released. This happens when the cocoa bean temperature is around 250 F. This is your sign you are just about done roasting. Experience and smell (you don't want any burned smell) are the key indicators when the beans are roasted. Once the cocoa beans are roasted and cooled, try separating the husk from one. If it comes off easily, you did well and the beans are fully roasted. Likewise, taste some. They should have a nice cocoa flavor, with no raw or burned flavors. Generally I like to have a roast take 15-20 minutes, regardless of method. Under that amount of time and the beans seem to retain a raw unfinished flavor. Over that and they start to taste baked and sort of flat. Criollo (because they are light in chocolate and fruit) tends to benefit from a more gentle and end with a lower temperature, where as Forastero MAY need more aggressive roasts with a higher end temperature when they are big on chocolate and fruit. So far I have had a reasonable degree of success at keeping the roasting under 270 F and stopping the roast before the "baking chocolate smell" goes away. Overall, don't take them too hot, but experiment and roast a lot by smell. If it smells like chocolate, you are on the right track. That I am aware of, virtually everyone has an oven in their kitchen, and you can roast cocoa in it. Here is an excerpt from one of my (ancient) logs. You can see how I have slowly dialed in what temperatures to set the oven at and how to adjust it. In general, if you try oven roasting, you will start hot (350-400 F) for a short amount of time and slowly lower it to your target temperature (275-300 F). This is for about 2 lb/1 kg of beans. The more you are roasting, the higher your initial temperature can and has to be and the time will probably be a little longer. 300 F for 10-15 minutes or until done*. Look for the aroma of baking brownies and/or pops. Both are good indicators you are there. *For an even better indicator of a complete roast, use an infrared thermometer and roast until the beans show 250-260 F. Make sure you stir the beans before taking your reading so you don't have a high bias. If you have nibs, you both can and need to take them a little more gentle. That is really it. Of course, there are LOTS of other ways you can do this. I know some people roast at 250 F (or even 220 F) for 45 minutes to an hour or even two. I am personally not a fan of this style, but you may be. And hey, nearly everyone has an oven. If you are going to be serious about roasting cocoa beans at home, and/or making chocolate, this is the method I recommend. It has the most flexibility, consistency and gives the best overall product for the least amount of work. You can either make your own if you are inclined or obtain one from RK Drums. These are both high quality stainless steel, sell for around $200, and will last a lifetime. With any of the drums, you will roast on a gas grill, with a thermometer inserted just below the drum and rotate the drum with a generally available motor or rotisserie that rotates anywhere from 6 to 60 rpm. I pre-heat mine to between 350 - 400 F, and load anywhere from one to four pounds into my drum. Once the grill is up to temperature, I place the drum into the grill and start it rotating. You will see the temperature drop of 50-100 F depending how much you loaded. Resist the urge to turn the temperature up. Just let it come back up over time. After about 10 minutes, you should start to notice a nice brownie smell and the ambient temperature should be back in the 300-350 F range. Don't let it get over 400-425 F as it can start to get out of control as the beans dry out. In another 5 minutes the cocoa beans should start to crack. Give them about couple of minutes, smelling, judging and guessing when they are done. Get your fire proof gloves on (did I forget to mention these? ), remove the drum, dump the beans in a waiting bowl, and stir until just warm to the touch. This is what a previous non-too-glamorous setup looked like. The drum very comfortably roasts 3 lbs and could probably do as much as 4 lb or as little as one. This was my third batch and actually, this roast got a little out of control. The collar holding the drum closed slipped (now it has a new collar) and some beans dropped in causing a very smoky fire, hence the sooty appearance on the beans. Since I consider this just about the worst I could do, I figured I would go ahead and process these into chocolate and see just how it comes out. It is often said that cocoa beans have a narrow window of good roasting, but these tasted pretty good. Mostly, they are not pleasing to the eye. By the time everything had rested, mellowed and melded, the chocolate was just fine with no hints of smoke or off flavors. There are only two off the shelf coffee drum roasters that I know of that can do a reasonable amount of cocoa beans on a small scale. The Behmor 1600 and the Hot Top. Between the two, there is just really isn't any contest. The Hottop will do 6-8 oz of cocoa, maybe 12 oz if you push it. The Behmor 1600 plus can do 2-2.5 lbs. With both of them you will need to judge when the beans are finished and stop the roast manually as they are programmed for coffee. I have not had the opportunity to experiment with the Hot top in a number of years, so I can't really speak about it's current level of programming. The Behmor on the other hand, I have worked with a lot. It has 5 roast profiles, that are all suitable for cocoa roasting. Now, in the same way you can use a Behmor 1600 Plus, you can use pretty much any commercial drum coffee roaster if you have the use of one. There is no cross contamination of taste either. I roast coffee and cocoa in the same roaster and both taste as they should. I personally use an old Royal #5 which runs off propane and can handle 15 lbs of coffee. But because cocoa roasts so much cooler than coffee, I routinely roast 30-35 lbs of cocoa. As a rough temperature profile, I pre-heat to 350-400 F, and drop in my cocoa. With a thermometer in the bean mass, the temperature usually drops to the low 100's. I then roast, adjusting my heat, to reach 250-260 F over about 13-18 minutes. Yours of course may vary, but as a bench mark, for me, the beans just start to crack in this temperature window. So if yours shows 300 F or 240 F, fine, that is roughly your 'new' target temperature in 13-18 minutes. And those time and temperatures are not set in stone - they are to give you a guideline to work with, and then adjust off of after you have made it into chocolate. Too sour? Try a little longer and/or hotter. A little acrid? Try dropping your final temperature a bit. To acidic and acrid? Roast it a bit longer (to reduce acidity) but do it more gently (to reduce the acridness). Get the idea? Hopefully so. I have developed a method of Profile roasting cocoa that is remarkable similar to the profiles used by coffee roasters. You have a drying, flavor development and finishing phase. In lieu of repeating (for now) what I have written in great detail, I recommend you go read Ask the Alchemist 200 through 206. I go into each phase in great detail and how you can adjust each one to reliably alter the flavor profile of your chocolate to suit your tastes. I want to make it VERY CLEAR this is about DRUM roasting and can NOT be applied to oven (even convection) roasting. This is only kind of an option for roasting cocoa beans. I mention it only because I use a modified West bend popcorn popper to roast my coffee in at home, and for a couple of ounces of cocoa beans, it works well enough. It is not really a practical way to roast a large (or even a moderate) amount of cocoa beans and nibs tend to fly out. Regardless, what I do is toss in a couple of ounces, turn on the heat, and watch the beans swirl around. In 3-5 minutes, they are usually cracking very loudly and I turn it off and cool them down. Good enough for token evaluation purposes but it is a little to fast and hot for a proper roasting. This again is from the realm of coffee roasting. It is not high tech, but it gets the job done. Basically, place 1-2 lbs of cocoa into a shallow bowl (the coffee roasters use a dog bowl, really), use the heat gun to heat the beans, while you manually stir them. In the same vein as before, add a lot of heat initially, back off as the roast progresses, and stop when cracks are happening and it still smells like baking brownies. I will be updating this particular method as I get more experience. To make chocolate, this husk must be removed from the cocoa bean. The goal here is to crack the cocoa beans into pieces and then separate (winnow) the husk from the nib. The goal is to go from whole beans to nibs. Deluxe Cracker - a stainless steel and brass cracker build for the Aether for extended lifetime and faster cracking. After proper roasting, you will notice the outer husk is much looser and easier to remove. It sounds simple enough but just a few years ago, there were no equipment that worked off the shelf. I contacted two companies to see if they had any interest in modifying one of their products to handle cocoa beans. Crankandstein worked with Chocolate Alchemy and the Crankandstein Cocoa mill was born - a heavy three roller, dual drive, set gap mill. Sadly they decided to stop making them. At this point I can recommend the Champion Juicer for cracking both raw and roasted cocoa beans. After your beans are crack, you then need to separate them husk and nib. In exactly the same vein as cracking, there are a range of things that work and don't work. Don't fret too much about a few pieces of husk here and there. The industry standard isless than 1.5% husk. That's actually quite a lot. This method can easily get you under 1%. The screen in the Champion will remove those few bits, and actually make a very nice filter bed if you go that route. And otherwise, it can go straight into your Melanger. You can find more information for the Sylph here. Here is a nice overview of both the blow dryer method and using the Sylph. First off, expect to make a mess! It gets better with experience, but initially, cocoa will go everywhere. After your cocoa beans have been roasted, and possibly cracked and winnowed , the next step in chocolate making is to grind them until they liquefy into cocoa liqueur. Again, I have found many pieces of equipment that just are not up to this task. To name a few, general food processors, Vita-Mix, coffee grinders (burr and blade), meat grinders (manual and electric) and mortar & pestles (we are talking alchemy here after all) are just are not sufficient to the job at hand. I have heard that a Cuisinart juicer attachment can work, but most juicers will not work. What does work remarkably well is the Champion Juicer. It grinds and separates the husks rather nicely. It does take a few of passes, and care must be taken not rush, as the cocoa mass can become too hot, and flavor can be impacted. I have successfully done a 4 pound batch of cocoa beans in 1/2 hour. This may seem like a long time, but it really is not. After you hit a routine, you can even be cleanup and have your chocolate into your Melanger and refining within an hour. You want to feed the nibs into the Champion (with the fine screen on now) a handful at a time, using just enough pressure on the tamper to feed the nibs in, but don't bare down - it will just overheat the motor. After two or three handfuls you should see cocoa liqueur coming out of the bottom screen, and whatever husk is left coming out of the spout. Put all of your cocoa nibs through and collect the liqueur. Don't put it through the Champion again as it does not really do anything and just makes a mess. On the other hand, you should now pass the husk and cocoa liqueur that came out the spout back through the Champion. Each pass will allow more and more husk to be separated out until only husk is coming out of the spout. If you have winnowed well, you may not have any come out by the end. I used to advocate mixing in your other ingredients in at this point, but since we discovered the Melanger for refining, it really serves no point to add in your sugar. If you are going to put your chocolate straight into the Melanger or simply know how much extra cocoa butter you are going to add (if you are adding any at all, it is optional), I do advise putting it through the Champion now. What it will do is free up the last of the cocoa liqueur that is in the Champion, and "flush" it out. A lot will come out the spout with more husk. Just pass it through over and over until all the cocoa butter is through the screen and "dry" husk it coming from the spout. As for how much cocoa butter to add, there are no hard rules about proportions or ingredient but here are some rough guidelines. Sugar content can generally runs from anywhere from 20% (i.e. 80% cocoa, a rather bittersweet chocolate) all the way to 70% sugar (Hershey's). I have found 60-65% is a nice place to start experimenting. Cocoa butter is not a necessity, just an option. It can run anywhere from 0-20%. At 20% the result may be interesting and certainly milder, but also creamier. So far, I like 0-8%. Lecithin you will find in almost all ingredient lists of chocolate. As it says, it is an emulsifier and is often added at 1-2% of the extra cocoa butter you add. Not a lot. On the other hand, I have one test batch with 2% total added, and it definitely gave an extra silkiness to the chocolate. Aside from flavor and texture, the test batches with lecithin processed noticeably easier through the Champion Juicer. I use granular from a local health food store. I have not tried liquid but am told it works fine. What does all this mean? Experiment! Start somewhere around 60% cocoa, 35% sugar and add a little extra cocoa butter (5%, about an ounce for the batch sizes we are working in) and lecithin if you feel like it. Adjust the recipes after than. It will still be good regardless of what proportions you use. Once it goes into the Melanger it starts out quite the ungainly mess, and looks like it can not possible work, but Alchemy it is! I have noted that there tends to be some confusion when people talk about conching and refining chocolate. It probably does not help that I have even put the two processes on the same page. But I want you to understand that they are two separate processes with two different goals in mind. Sometimes conching and refining can happen at the same time, but they do not have to and often you do not want them to. Some definitions are probably in order. Conching Conch comes from the Spanish word concha, which means shell. The name "conching" arose because the original vessel used to hold the chocolate was shaped like a conch shell. Conching is a modern process used in making chocolate The characteristic taste, smell and texture (and by this, I mean general mouthfeel, not particle size) of chocolate are developed at this stage. The process of reducing the particle sizes of both cocoa solids and sugar crystals in finished chocolate. The goal is somewhere in the range of 15-25 microns. Your tongue loses its ability to determine texture and grittiness at around 30 microns. Under about 10 microns the chocolate can get gummy. We will worry about over refining when we get there. We can only hope for that problem. With that all said, what we have found that works remarkable well for both Refining and Conching is the Spectra 11 (previous known as the Alchemist's Stone Melanger). If you notice, it looks a lot like a commercial old style Melangeur. The Spectra melanger has a heavy motor that rotates a granite slab (10 lbs) and two large heavy (7.25 lb total) granite rollers at about 150 rpm. The whole thing is just under 50lbs! Oh, and I just saw they say it is "light weight" - don't you believe them - this thing is a heavy duty monster - and that is great! Really, the pictures just do not due it is justice. Just have a look. So, how do you use the Melanger? I suggest pre-heating the bowl and rollers. Don't go over 150 F as the epoxy can fail. Melt any cocoa butter you are going to add. Anywhere from about 120 F on up to 250 F.
If you are using liquor, melt and add it. If you are using nibs, heat them to 120-150 F and add them in small handfuls, giving the Melanger time to grind them down. Add more as it gets smooth. You can add your pre-heated sugar at this point too. There is no need to pre-grind your sugar. Regular granular sugar works great. NOTE: Do not add ANY water based ingredients to your chocolate in the Melanger. The chocolate will seize and you can damage your Melanger. After the first hour though, the chocolate becomes more liquid like and the whole thing generates enough heat by friction that additional heat is not really needed. After that, I have found a difference in texture after every hour, with "smooth" chocolate occurring around 10-14 hours. With the freshness and quality of ingredients we are using, I have found no degradation in flavor or signs of over-refining after 24 hours of refining and I have word from various customers that it performs great up to 36 hours (not that there is a problem after that, just that they refined that long). It is that simple. If you need to stop the refining, just do. It will not hurt a thing. I turn mine off at night, put the bowl into a pre-heated oven (about 150 F, with the oven then turned off) and let it set overnight. It is usually still liquid in the morning and I can just restart the refining. If it does solidify, just turn the oven on about 150-175 and melt the chocolate. Take the cover off for better heat transfer and so you don't melt it. Finally, the bowl is held together my an epoxy that has a maximum temperature limit of about 170 F. It can handle a 200F for a short time, just don't let everything get that hot. My latest batch of chocolate was two pounds of milk chocolate. After refining for 10 hours, at 1 hour increments, there was no noticeable grit left from the sugar. During that time, some conching occurred to - there was a marked increase in viscosity (which is what is supposed to happen) and some of the sharper flavors at the beginning have mostly disappeared. Conching has to occur to some degree as there is tremendous shear where the 120 rpm granite rollers rotate against the lower spinning granite slab. After about 5 hours you can see most of the grit has been refined away, but you should note that there is not a lot of gloss to the chocolate. It means is it not ready yet. This is the chocolate all finished. There is a nice high gloss, and you can even see the chocolate sort of spinning off of the granite rollers. Of course, the real test of whether it is done or not is "do you like it?" and "is it smooth enough?". Only you can answer those questions. In addition to the above basic instructions, there is also the Chocolate Melanger Instructions and tips which give a bit more detail on how to use (and not abuse) the Melanger. In the mean time, the following will give you a bit more detail as to what in involved in refining and conching. The process involves heating and mixing for several hours to several days the ingredients of chocolate - cocoa, cocoa butter, sugar, lecithen and and any "flavoring" such as vanilla or essential oils. For milk chocolate, dry milk powder is also included in the mix. (don't try to use liquid milk, it will seize on you). 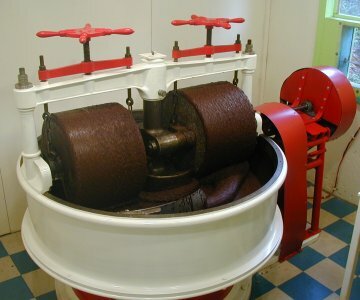 During conching, the chocolate is heated to temperatures of 110 to 180 F, sometimes externally, sometimes just from friction. In the "industry" many Milk chocolates are heated to temperatures over 160 F to allow the lactose crystals to transition into amorphous lactose. This transition is often why milk chocolate has that soft and silky mouth feel. Some people (both commercial and at home) don't do this, and that is fine. Especially at home, it is your choice. I find the 140 F often reached in the Melanger does just fine. Regardless, during Conching the sharp taste of the fresh cocoa slowly disappears. At the same time the acidity and bitterness of cocoa are lost and the moisture content is reduced (there is actually debate over this) and the delicious chocolate flavor becomes fully developed. Simultaneously in the process, the smoothing of the cocoa and sugar particles takes place with cocoa butter forming around each of the small particles. This is different from refining really. The particles of sugar and cocoa are smoothed out in conching but not substantial reduced in size. Conching is done for several hours or up to three days. Finally, there are basically two thoughts on conching - low and high shear. When conching was discovered, there was only low shear, and this is probably why it could take up to 3 days. With modern equipment, there have been a number of conching advancements, notably high shear conches. These supposedly (there again is great debate) can conch a batch of chocolate in under 15 minutes. The high shear causes the volatile components to be quickly liberate from the cocoa mass. There is no real right way or amount of time to conch. It is up to you and what you want your final chocolate to be like. All I can do is give you certain guidelines. Certain Criollo cocoa beans are chosen because they are bright and fruity. You would not really want to conch that for 3 days because you are just going to drive off those qualities that you choose the bean for in the first place. And you will need to keep balance in mind in that desirable and undesirable compounds are driven off during conching. The trick is to find that combination of conditions (low or high shear, high or low heat, short or long time) that give the chocolate flavor you want. Conching is probably the least understood process in modern chocolate making and consequently the most Alchemical of the processes. Finally, try not to worry too much over it. Even if you chocolate is not exactly like to want it, it is still going to be good, primarily because you are using fresh quality cocoa beans.Right now there are no heated home conchs, only the Santha that conchs as it refines. The present plan is that we can further modify the Santha to be heated. We are working on that and will keep everyone up to date. We have come a long way since Chocolate Alchemy started. You if want, you can go read some of the History. Why temper chocolate? It is what gives the chocolate bars you eat that finished glossy, shiny appearance and that nice snap when you eat it. If you don't actively temper your chocolate, you might get lucky or you might not. The left most picture is of a piece of chocolate that is not tempered. It has just a matte appearance, is soft and melts readily if you try and pick it up. After a couple of days untempered chocolate tends to "bloom". That is the middle shot. It still tastes fine, but I find the texture of bloomed chocolate a little odd. Kind of coarse. Finally, the right most chocolate is tempered. It has a nice shine, snaps when you break it, and does not melt as you are trying to pick it up. What is Cocoa Butter Silk? Why should you care? and how does it make tempering chocolate easier? Tempering involves bringing your Alchemical chocolate creation to a temperature at which the cocoa butter reaches its most stable form. Many people seem to be quite confused about tempering and what is going on. One day it finally snapped into place (pardon the minor pun) what was going on. I have done my best to explain in these combined articles. Chocolate will crystallize (incorrectly) if any moisture gets in it. When tempering chocolate, you must keep your chocolate dry at all stages, after all, you just spent days refining it to remove the water. Just look what a little bit of water can do!!! If you really get into making chocolate, it might be worth it to consider purchasing a chocolate tempering machine although I personally prefer the hands on process. These appliances take much of the guess work out of tempering. There are lots of ways to temper chocolate and they are all over the internet. And the details can vary quite a bit. You can temper over and over. If your chocolate blooms, it is not ruined. Just melt it again and start over. You may see you need to melt your chocolate anywhere from 100 F to 135 F. Anywhere in there will work. You will not burn your chocolate even if it gets above 160 F. Many milk chocolates refine that hot. What is important is that you use a double boiler to heat your chocolate. Heating chocolate directly in a pan over heat can indeed burn chocolate because the surface of the pan, even on low, can get above 300 F.
I recommend tempering in bowls. There is nothing special about using a machine, or a marble slab. I find I have more control with bowls and can work without rushing. Melt your chocolate in a double boiler until the chocolate is at least 105 F.
Pour about 2/3 into another bowl. Set the other 1/3 to the side and keep it warm. Stir the 2/3 portion until it starts to thicken. This happens about 79-81 F. The thickening is a sign you have created seed. Slowly add parts of the warm chocolate to the cooler, seed chocolate. Do it little by little until the temperature is 88 F (86 F for milk chocolate). Pour up into molds and let set up. Now the details. Let’s do this. They should read the same temperature. The first thing is you need a good thermometer. One where you can see 1 F increments. That means no candy thermometers. The just are not accurate enough. Also, you cannot use IR or laser thermometers on the water. You need a probe thermometer for that. The laser needs something to bounce off and water screws it up. Have a look (left picture, note the differences in temperatures). You can of course use either for chocolate and I personally like a laser thermometer. 4 bowls that nest together. You don’t need an official double boiler here. Just a bowl on top of a pan was warm to simmering water. Again 105-130 F is just fine. The higher you go just means you have to wait longer for it to cool to a reasonable temperature before you can use it. Chocolate or more specifically cocoa butter forms 5 different types of crystals. Our goal in tempering is to make one called Type V. Heating the chocolate above all of the melting points gives you a clean slate to work with. I find it very helpful to put my bowl of warm chocolate into a bowl that contains warm water. 90-95 F. Remember, use a probe thermometer, not an IR or laser.. Likewise, put the other chocolate into a water bath that is cool. 60-70 F works well. Water baths help either keep the temperature stable or move the temperature in the direction you need it to go. Make sure the lip of the inner bowl is higher than the outer bowl or water may spill into your chocolate. Stir the 2/3 portion until it starts to thicken. This happens about 79-81 F. The thickening is a sign you have created seed. You may also hear it referred to as cooling until the chocolate traces. Note: If you happen to cool your chocolate too much and it gets very thick, nothing is ruined. It is only harder to work with. Just stir in a little of the warm chocolate you have in to make it workable, or change water baths so the thick seed chocolate is in the warm one. Once it is workable, just proceed as normal. At this point you have created Type IV and Type V crystals. When you cool chocolate both naturally form at the same time. The thickening is the sign you have enough Type V to ensure a good temper. The exact temperature does not matter. It is often helpful to still have a thermometer handy to see how close you are getting. Your initial goal here is just to raise the temperature a little so the chocolate is easier to work with. At 88 F only Type V crystals can survive. The Type IV that you created when cooling will melt. Now that there is only Type V present, the chocolate has a scaffolding to build upon and the chocolate will crystalize properly giving you tempered chocolate. Pour directly from the bowl into your molds. Make sure you wipe the bottom of bowl so no water drips in. Use a large ladle. Do your best not to use more than one scoop per cavity. Rap the molds on the table to settle the chocolate. What to do if you over pour? Don’t scrape the chocolate off at all possible. If you must scrap because you poured too much, do it only one time and then rap the molds again. Crystals are fragile. Scraping and disturbing the chocolate while it is setting up can disrupt the crystals. These disrupted crystals can lead to bloom. Wait a few hours for your chocolate to fully cool and temper. Then briskly turn the molds over and you chocolate should pop right out. I don’t think I need to tell you how to enjoy the chocolate. To refrigerate or not. This is a little of where the art and science comes into play. Some people swear by it, some find it causes issues. Here is what I can tell you. If you have a lot of Type V crystals and your room is on the cooler side (under 70 F), you probably don’t need to refrigerate at all. The crystals will build upon each other just fine and your chocolate will temper perfectly. If you are a little low on Type V crystals, or the temperature is a little warm (above 75 F) you probably want to put your chocolate into the refrigerator for 5-10 minutes. But watch out. If they are in too long or it’s too cold you can rush the temper, causing it to be unstable and bloom will be the result after it comes out of the refrigerator. What to do if your room temperature is 70-75 F? My recommendation is to try and let your bars set up at room temperature. If it works and they temper, you are good to go. If you find they are a little slow to set up or you have minor bloom issues, let them set at room temperature 4-5 minutes. Then put them into the refrigerator again for about 5 minutes; just enough to kick start the process. Then let them finish setting up at room temperature. I mentioned before there are lots of ways to temper and way more to tempering. Check out the links below for more. Why does tempering with silk work so well? Winning at tempering three card monty, i.e. knowing where the Type V crystals are at all times. Now, Go Make Some Chocolate! So why am I going to answer it again? It boils down to the scientific method. Science, good science, by its nature changes and evolves as we learn new things. It does not necessarily invalidate previous findings completely. It refines it and fine tunes it. To that end, I have somewhat a new answer to this question in that it appears (note the disclaimer for future updates of failure) that I have successfully tempered chocolate with honey in it. We've noticed that different beans seems to have different amounts of intrinsic oil. The Peruvian Maranon seems to have quite a bit of oil and produces a chocolate that flows very easily but it tricky to temper correctly. Is there a way to know in advance the amount of oil in a bean so we can adjust the amount of cocoa butter we add? In one of your articles you mentioned you like silk tempering more than chocolate seed tempering because of the strength of type V crystals in tempered cocoa butter. Can a chocolate tempered with chocolate seed have a chance of blooming because of the seed? I'm not sure if my last question made any sense but all I'm trying to understand is why chocolate seed crystals are not as good as silk seed crystals? (1) In using the seeding method (with tempered chocolate from the bag or from a bar of the same chocolate), I learned that it doesn't take very much seed for the chocolate to test as in temper--not the 30% or so that many (most?) people recommend.